The American Company Motorola mobiles is soon going to launch a new mobile Motorola Atrix 3. The launch date of the Android mobile phone is not confirmed. The company has also not announced the Motorola Atrix 3 price in India. It is rumored that the Motorola Atrix 3 will be coming with quad core processor, 10 MP camera and a huge battery. The Motorola Atrix 3 pictures show that the mobile will be coming with touchscreen. The Motorola Atrix 3 features reveal that the mobile will be coming with touchscreen mobile display. The size of the screen will be 4.3 inches and it will be having 720 pixels resolution. The mobile will be running on quad core NVIDIA Tegra 3 processor. The rumors about this mobile also say that the mobile will be having 2 GB of RAM. Other Motorola Atrix 3 features include a 10 megapixel camera which is capable of recording FullHD video. The camera features of the mobile include dual LED flash. The mobile consists of a high capacity 3300 mAH battery. The battery of the Motorola Atrix 3 can be compared to Motorola Razr which has the same battery with same capacity and has 38 hours of battery life. 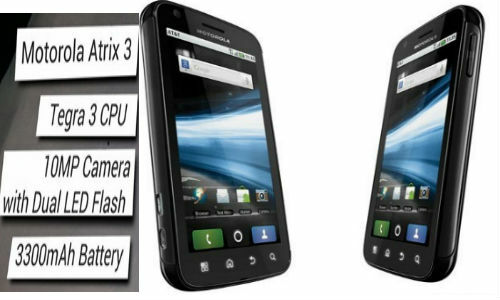 The Motorola Atrix 3 pictures show that the mobile has similar looks as that of Samsung Galaxy Nexus and also have Motorola logo.